This firmware is intended to upgrade the AQ7280 to the latest version. On the top menu, press SETUP and then the Product Information soft key to display the screen. Applicable inspection probe for Pass / Fail judgment (/FST option) of fiber inspection function. Switching of graph display unit in OPM logging function. Saved data format in OPM logging function. Modification of unit. Folder copy function in file operation menu. Recalculation of total loss and total reflection attenuation in event editing. Added the setting of cumulative loss type in the event analysis. The auto setting for distance range. The transition of the multi-fiber measurement screen. The event search with a launch fiber. The operation window of the utility menu became movable. Added the loss value indication for the end point in the event analysis. Added the File ID to the Fiber ID in the File Saving function and Report function. Added the operation expiration date setting. Improved the touch screen operations e.g. operations in OTDR Trace area etc. Improved the display position when the inspection probe DI-1000L is used. Improved the loading of SET file. 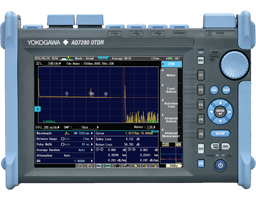 Supported the New OTDR units (AQ7283E, AQ7282G, AQ7283J). Supported the Stabilized Light Source function (/SLS option) of AQ7282M OTDR unit. Increased maximum number of fibers up to 2000 fibers (multi-fiber measurement function). Added separate settings for each fiber labels (multi-fiber measurement function). Added function to output spreadsheet as TEXT format for all fibers (multi-fiber measurement function). Added pulse width measurement condition indication. Improved the event analysis for measurement with using dummy fiber. Improved the PJT file sabing to USB memory. Improved the threshold setting for Pass/Fail judgement in multi-fiber measuremnt function. Improved the filename matching when saving and displaying. Improved the measurement algorism of splitter measurement. Improved the event analysis under short pulse width measurement. Modified the default setting of measurement wavelength that is in the revised multi fiber project file. Added the Remote function by Web browser. Become able to rename the file comment or Label during averaging measurement. Selectable total loss calculation method. Improved the event analysis under 1650 nm measurement. Improved the event analysis, except AUTO setting measurement. Added a dual waveform report format. Added a Map view report format. Added Icons of event type. The external memory is available to save the multi-fiber project file. The remote control is available via mobile network by using UPnP mobile rooter. Confirmation window appears before fiber-scope data overwrite. Apply to SMP file in File report function. Display the any snapshot always with any wavelength. The utility windows form a line on the bottom display. Improved the response for zooming by double tap. Control the map display by icon direct. Selectable wavelength for multi WL measurement. Added initialize function for variable stitching line. Added the event fix mode. Become able to monitoring the any points. Added initialize function for schedule settings. Be available to select the format of setting-item-window. Added the remote command for the query of the measurement setting information. Restrict to use the distance origin and dummy fiber setting. Pop up the marker window when cursor is operated by rotary encoder. Added the "Select All" to menu of file report function. Be available to display the data of OPM/fiber inspector that was saved. Changed the Default setting of [Adapt trace] to ON. Enhanced the Smart mapper measurement result. The AC adapter is not required anymore to run the schedule measurement.